(CNSNews.com) - As reported in Table IV of the Daily Treasury Statement, the U.S. Treasury collected approximately $21.672 billion in taxes on Christmas Eve, the first business day of the partial federal “shutdown” that began at midnight last Friday. Those Christmas Eve tax collections brought total federal tax revenues for fiscal 2019, which began on Oct. 1, to approximately $666.482 billion. On Friday, Dec. 21, the last day before the partial government shutdown, the Treasury collected approximately $10.876 billion in tax revenues, according to the Treasury statement for that day. That brought total tax collections for fiscal 2019 to approximately $644.811 billion--at the beginning of the partial shutdown. The additional $21.672 billion in taxes the Treasury collected on Monday, Dec. 24—while the government was partially shut down—brought total federal tax collections to approximately $666.482 billion for fiscal 2019. Even though Congress has not yet passed an appropriations law to fund the Treasury Department in fiscal year 2019, the department has continued operating with “essential” workers showing up and doing their jobs—including on Christmas Eve. 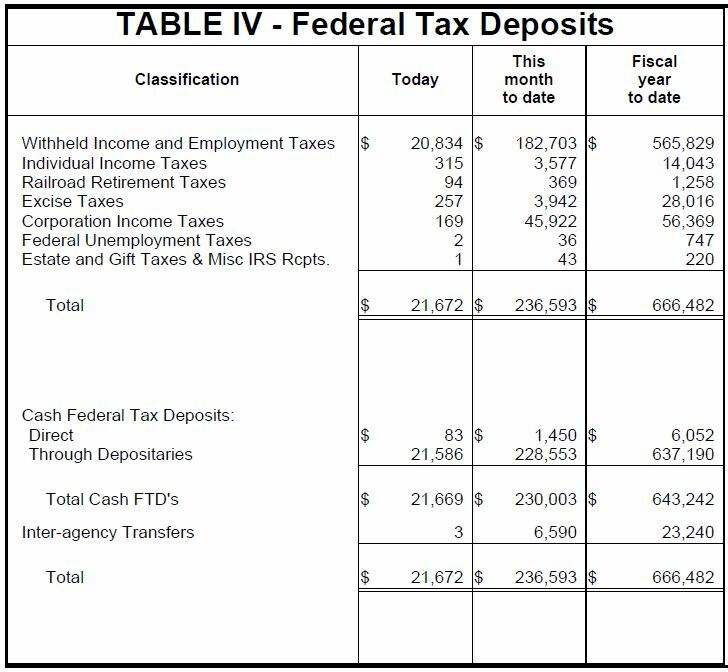 As a result, the federal government not only collected that $21.672 billion in taxes on Christmas Eve, according to the Daily Treasury Statement, but it also spent $8.789 billion. The largest category of federal expenditures on Christmas Eve, as reported in Table II of the Daily Treasury Statement, was $1.421 billion for Medicare and other payments by the Centers for Medicare and Medicaid Services. The second largest was $1.369 billion in payments to Defense vendors. The third largest was $808 million in payments for Medicaid. The fourth largest was $730 million to redeem securities issued for the public debt. The fifth largest was $466 million paid out in grants by the Department of Health and Human Services. The sixth largest was $451 million for the food stamp program. Among the other expenditures the Treasury made on Christmas Eve, when the government was partially shut down, was $92 million for the Agency for International Development.